The Likely Suspects: Restrictor-plate racing is not for the faint of heart. The speeds and the high probability of a huge wreck make it hard at times to watch even as a spectator. I can't imagine what it is like as a driver. Although this race is not known to materialize the ultimate champion, a driver can lose the championship on this dangerous track. The likely suspects this week fall into one of two categories: patiently-skillful or down-right crazy. Among the 'Dega' notables are Matt Kenseth, Dale Earnhardt Jr., Kyle Busch, Brad Keselowski, Jeff Burton, and Clint Bowyer. My 2 Cents: When picking this week - think pairs. 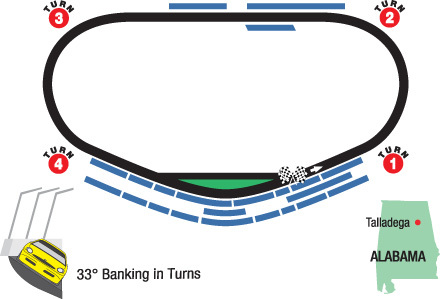 Although NASCAR has tweaked the cars to make it harder to do the two-car tandem, breaking up is hard to do. You'll see the pair-ups particularly near the end of the race. My no-brainer pick this week is Kyle Busch who pushed Brad Keselowski in the May race, and then tried to do a slingshot maneuver around him only to be blocked. Equally no-brainer material are Dale Earnhardt, Jr., and dark horse Jeff Burton who always perform well at Talladega. I will round out my team with Joey Logano, Kasey Kahne, Michael Waltrip, Matt Kenseth, and David Ragan. Keep in mind if you have any Clint Bowyer starts left, I'd swap out Joey for Clint. Another worthy pick is Brad Keselowski.